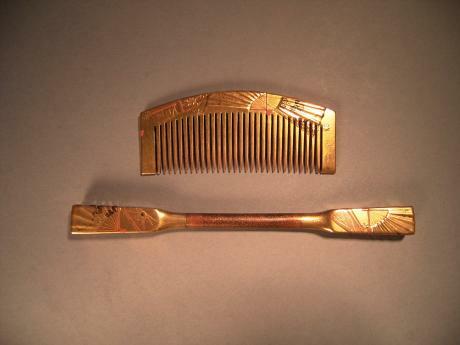 Japanese early Showa Period comb and bobkin set. The set is done in colored lacquer with silver and shell inlays. The design is of various flowers and berries. The comb measures 4 1/16" long, 1 3/4" tall and 1/8" thick. The Kogai or bobkin measures 6 1/8" long, 7/16" tall and 1/4" thick. (don..
Japanese Mid Showa period red and gold lacquered wooden comb. 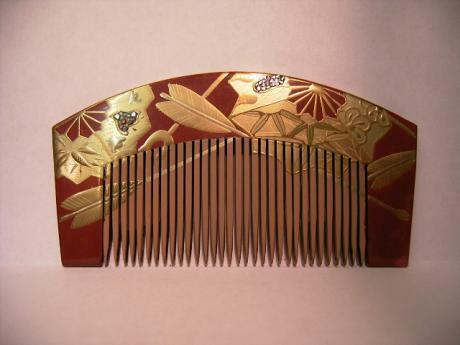 The base of the comb is wood which has been lacquer in red and gold lacquer with shells added to spots in front. The comb measures 4 1/8" long and 2 1/8" tall. 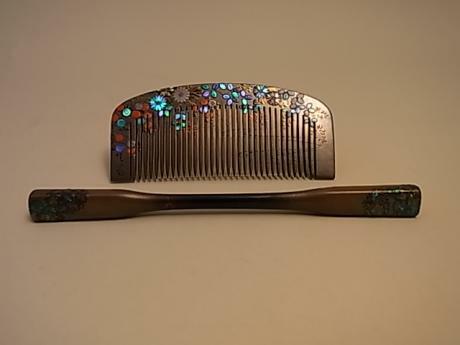 Japanese Taisho - Early Showa Period lacquered comb with spiny lobster design. 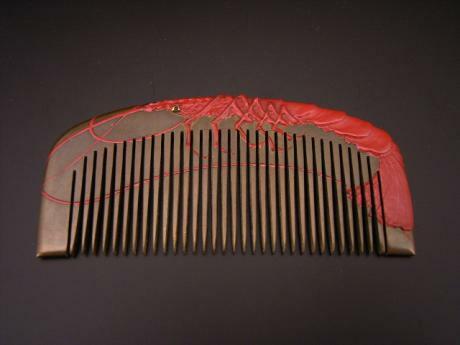 The base of the comb is lacquered in bronze colored lacquer with the spiny lobster done in red, gold and black lacquer. The lobster is done in relief. Unsigned. The comb measures 3 7/8" long by 1 3/4" tall. Japanese Meiji Period gold lacquer comb (KUSHI) and bobkin (KOUGAI) set. Gold lacquer in hiramakie, takamakie, kirigane and colored lacquering technqiues. Design is of fans with different designs. Signed on comb and bobkin by artist, KOMIN. Comb measures 3 3/8" width by 1 1/2" tall. 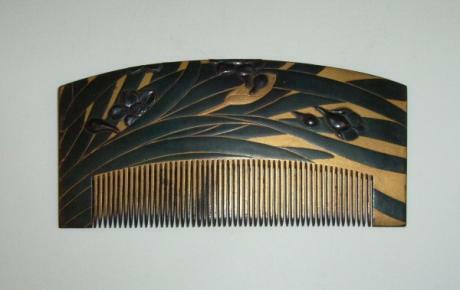 Bobkin is..
Japanese Edo Period lacquer comb with the design of daffodil done in black and gold lacquer in low and high relief. The design is done in beautiful detail and flowing form. The comb measures 5 1/4" long, 2 5/8" tall and 5/16" thick.